Do you like throwing parties? Do you want to make a difference for kids with cancer? We do, too! 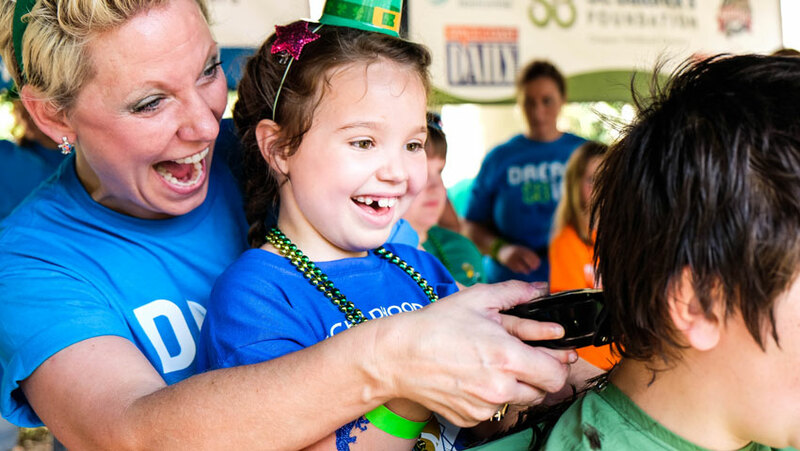 Join St. Baldrick’s and throw the ultimate shindig for good — a head-shaving event. Read on for five reasons to organize your own amazing event this year. Want to get to know your community? Nothing brings people together like watching their neighbors go under the clippers! Get involved in your community by uniting people around a great cause and having a great time. Our volunteer event organizers (VEOs) often invite kids with cancer, childhood cancer survivors, and families to share their stories and be celebrated. Organize an event and show those heroes some love! When you see them smile, you’ll know all your hard work was worth it. Thanks to St. Baldrick’s events and the funds they raise, researchers across the globe are making new leaps in the treatment of childhood cancer. By organizing a head-shaving event, you can be a part of progress toward cures for childhood cancer. Organizing a St. Baldrick’s event is like throwing a big party for your community. Who doesn’t want to party for a good cause? Having a fantastic time while fundraising for lifesaving childhood cancer research — it’s all part of the St. Baldrick’s event package. With over $258 million going to research in 29 countries, these events are changing the world for kids with cancer! So, what are you waiting for? Be a part of the change for kids with cancer. Start a head-shaving event today.